The Chūgoku region, consisting in the prefectures of Hiroshima, Yamaguchi, Okayama, Shimane and Tottori, has many prominent sightseeing spots, some of which we are introducing in this article. The Chūgoku region (Chūgoku chihō 中国地方), which comprises the prefectures of Hiroshima, Yamaguchi, Shimane, Tottori and Okayama, is located in the western part of Honshū Island. There is further differentiation within the actual Chūgoku region; the north is known as the San'in area, while the south is known as the San'yō area. There is a great deal of snow during the winter in the San'in area, while San'yō is temperate, with little rainfall. Compared to San'in, San'yō has a comparatively higher number of sunny days. Hiroshima City is the largest urban hub in the Chūgoku region, with a population of 11,740,000, according to a 2010 survey (currently 2016). Each prefecture in the region has an airport, and a flight from Tokyo to Chūgoku takes about 70 to 80 minutes. Shuttle buses run routes from the airports to train stations, so you should have no difficulty getting into the city. There are several famous sightseeing spots located in the Chūgoku region. The Hiroshima Peace Monument, commonly known as the A-Bomb Dome, is a famous installation visited every day by hundreds of travelers. It is also recognized by UNESCO as a World Cultural Heritage site. The monument is designed to teach present generations about the scale of destruction wreaked by the nuclear warhead which was dropped during World War II. 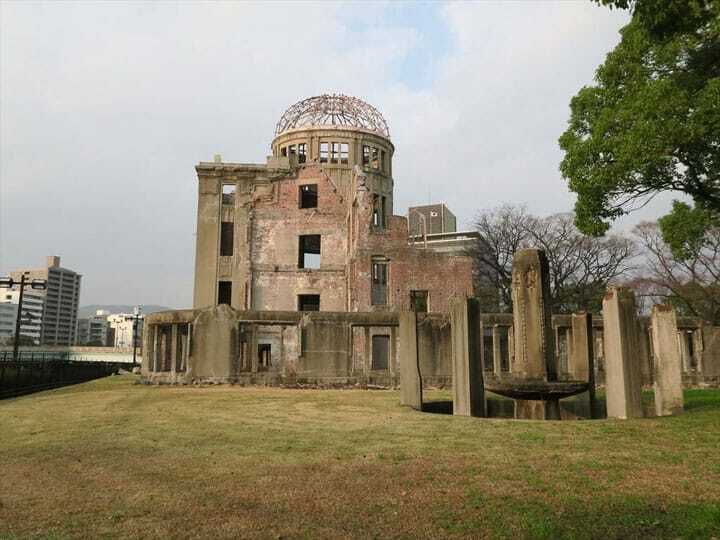 At the Hiroshima Peace Memorial Museum, directly adjoining the monument, visitors can find out more about the tragic state of affairs at that time. Some of the exhibits are hard to look at, but the museum is oriented towards creating a new drive for peace. Tsunoshima in Yamaguchi Prefecture has a spectacularly fascinating scenery. The sight of white sandy beaches and the 1,780-meter Tsunoshima Ōhashi Bridge, stretching across the cobalt blue ocean, is gorgeous enough to have been used in movies and television dramas, and it’s definitely worth seeing. Image from Five Famous Shrines That You Have to Check Out! Ever since ancient times, Izumo Taisha Shrine in Shimane Prefecture has been believed to be the gathering place of the gods. Izumo Taisha’s massive main shrine, which can proudly claim to be the tallest in Japan, is designated as a Japanese national treasure. Izumo Taisha is also famous for its ties to the gods of en-musubi (*1), which protect marriages and relationships. If you would like to pray for human connections - whether you’re looking for love or hoping for deeper relationships with work colleagues - you should pay a visit to this shrine. *1… En-musubi refers to the relationships and bonds of fate between people, particularly between men and women. When most people hear of “Tottori Prefecture,” they associate it with sand dunes. You could say that the designs drawn by the wind on the vast sand dunes which stretch across the coast of the Japan Sea are natural works of art. The Kurashiki Bikan historical quarter, located in Okayama Prefecture, is called Little Kyoto(*2), and preserves its beautiful, white-walled townscape, unchanged from old times. First, we recommend stopping by the tourist information center, situated in a stylish Western-style wooden building, to gather information. You can also purchase tickets for the riverboat sightseeing tour. *2…The moniker of “Little Kyoto” town is not a direct comparison to Kyoto, but refers to how Kurashiki retains the traditional character of its ancient townscape. The most well-known food items and souvenirs from the Chūgoku region reflect the climate and unique features of each prefecture. Hiroshima produces the most oysters in Japan, and they’re quite famous. The distinguishing features of Hiroshima oysters are their large size and rich sweetness. Freshly-caught oysters during the winter season are exquisite. We also recommend Hiroshima okonomiyaki, which have ample volume. In winter, Yamaguchi is the best place to get seasonal high-grade fish such as blowfish and Seki mackerel. For this reason, taut-fleshed blowfish and Seki mackerel sashimi are gourmet items that should definitely be savored in Yamaguchi. Shimane’s specialty is Izumo soba, one of Japan’s three best soba nooodles varieties, and known for its dark hue. How about trying some when you visit Izumo Taisha Shrine? Shijimi clams from Lake Shinjiko are also an unforgettable dish. Shijimi clams are famous for being good for the liver, so we recommend eating some after you’ve had a few drinks. Tottori and Okayama are well-known for their fruit. Tottori pears and Okayama peaches are quite delicate fruits, so the best thing to do is eat them where they were fully ripe. Furthermore, Okayama takes pride in producing the most muscat grapes in the country, which are also notable. In Okayama, you can enjoy picking peaches and grapes. The Chūgoku region, with its local food, culture and sightseeing places, provides everything a visitor to Japan would ask for. By all means, come take a tour.